1. Are the bumper mounting points a good, sufficiently strong enough option to mount to the rotisserie? Assuming a relatively solid shell. 2. Where is the centre of gravity of a bare shell? Having looked at lots of pictures of different cars on rotisseries and studied my own car, I'm guessing somewhere around the top of the front grill. Does that seem about right? I just noticed that you had no replies to your question about rotisseries. I don't know if this is of any help. It's a picture from my files of a roll-over frame rather than a full rotisserie. I was at Omicron last year and noticed that they were using a similar concept for a Fulvia they were working on. Thanks. That's actually quite clever. I've seen full octagonal roll-over frames used on Porsches, but never anything so minimal. I guess one issue with it is that it's much more limited in the range of access options e.g. the sill is either on the floor or near head height and if you wanted to get to the R/H side sill, you'd need to take both frames off (assuming there's another at the rear end not visible in the image) and reattach the other way round. But if you just need something simple to provide access to the underside, it's neat. I did actually contemplate building something out of scaffolding tube and connectors. It's relatively inexpensive, doesn't need welding so can be reused for something else when you're done and could also be designed to be modular i.e. reconfigured as a dolly etc. However someone then kindly pointed me in the direction of mk2mania who offer quite a versatile, well thought-out looking jig for £340, which seems reasonable, so I'll probably go that route. 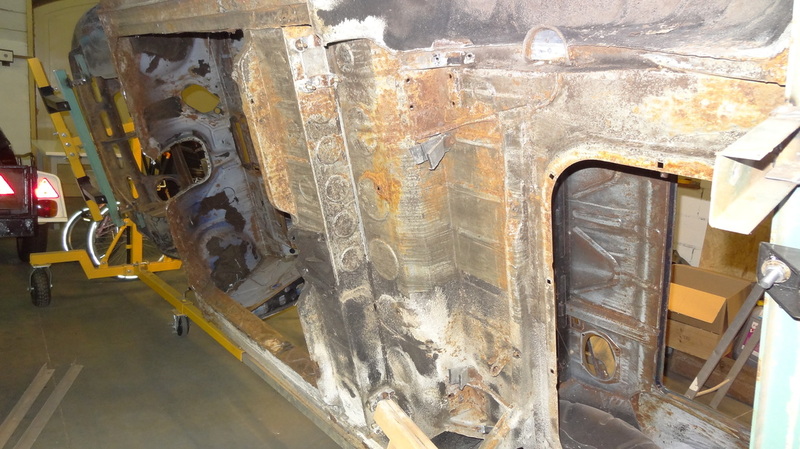 Did you come across the site http://restoshack.com/portfolios/lancia-fulvia-restoration/ in your research? This has some pics of a Fulvia on a rotisserie and how they opted to mount it. Thanks. That looks like quite a sophisticated set up. It appears to have air rams to raise and lower the car which would make mounting and finding a comfortable working height really easy. It's hard to tell from the pics but it looks like it's attached directly in front of the front arches and directly behind the rear ones. I can't think of any natural mounting points there though. I personally quite like the idea of attaching the jig at suspension mounting points or jacking points i.e. points designed to take the load. Although I guess no points were originally designed to hang a car upside down. There's also the pic: https://fulviafanalone.weebly.com/uploads/1/6/1/0/16104902/6691413_orig.jpg where suspension mounting points have been used at the front ... although no clear shot of the rear mounting solution. I guess you could always contact the guy who did this restoration via the 'comments' action on his site if you wanted more details...? The rotisserie shown on the Restoshack site is a full house professional item and uses a long threaded shaft to raise and lower the arms. it's probably too expensive for doing one restoration. Frosts do them from £1,000 upwards but lighter ones are available on e-bay around £250.